or the Harmonic Module, includes 20 galactic solar seals (Sun Signs) which represent 20 tribes on this planet, and 13 Lunar Tones which represent specific energies / frequencies. moving through cycles within cycles in time. 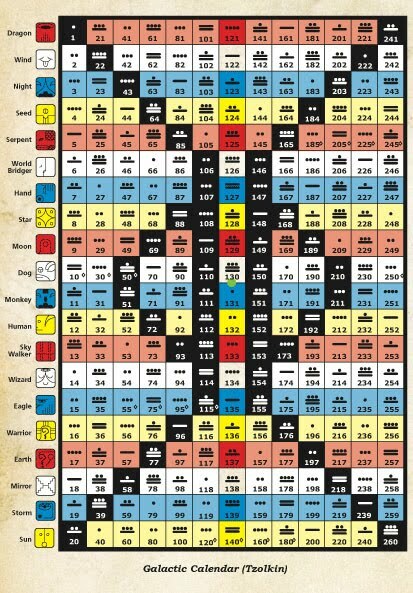 There are 260 unique combinations or personality patterns at the Tzolkin Calendar, the Holly calendar for the Mayan people from central America. An Enchanted cycle of 260 days which is combined of 20 wave spells of 13 days each, and then it repeats. ​Following the developing process of the 13 days 'wave spell' might bring change in our perspective towards time (life), and help us to release old patterns and to develop within us qualities of joy and positivity, connecting us to the vibrations of unconditional love which prevails on planet earth. The classical Tzolkin Calendar is one of the most important calendars for the modern people to understand.